Watch the on-line orientation video below, then come to the library to "borrow" seeds for free any time the public library is open. You can "borrow" seeds from any drawer, but when you first get started, only save seeds from the drawers marked "super easy". The idea is that people let some of the seeds they planted go to seed, then they return some of those seeds for others to borrow. Don't save seeds from the "easy" and "difficult" drawer for the seed library until you have learned more about seed saving. Visit our Seed Saving page for tips on how to save seeds so you can return seeds at the end of the season for others to borrow. Here are Six Tips for Saving Seed. We also offer a number of free classes on seed saving, which will be listed on our home page. Thanks for being a member of our community seed library. "Membership" binder in the glass cabinet. library card to borrow seeds. As a bare minimum, fill in the common name, variety name, and year grown. You may donate seeds you grew or commercially grown seeds. Donated seeds are put in the yellow colored "Donate" box in the glass cabinet. Please do not donate commercial seeds that are hybrids will be labeled hybrid, F, or F1. 1. Return well labeled seeds. We encourage you to print out the envelope label (PDF) at home and fill it in completely. This makes it super easy to put all the information on, and if you grow and save the seeds yearly, this will make it easy for you to share seeds for years to come. Extra copies of the label can be put in the envelope or jar with the seeds you are returning for borrowers to take. 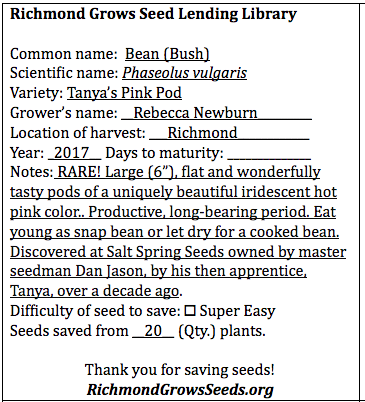 This is a nice courtesy to borrowers and the extra labels allows them to take home seed that is well-labeled. As a bare minimum, labels must have the common name, variety name, and year grown. 2. Enter the returned or donated seed information in the orange "Membership" binder located in the glass cabinet. 3. Put seeds in the yellow "Donate" box in the glass cabinet. Need to find the scientific name? The USDA has a search system that will help you find the current scientific name of different plants.